Major Motorsport supports the 'Kick Energy Pirelli Junior 1000 Rally Championship’ . The championship is open to any drivers aged 14-17. The aim is to give young drivers competition experience in entry level 1000cc cars. The series began in 2009, and graduates are already winning championships in senior rallying. Drivers must have completed 3 production car autotests, the BARS test and a formula 1000 entry test to be eligible for competition. We provide help and guidance for all the stages required to qualify for the Junior Championship. All of the qualifying tests and licensing can be organised and arranged by us. Co-drivers must hold a National A license or higher, be over 21 years of age, and be child protection accredited. We can provide co-drivers for Junior drivers. We cater for all aspects of car preparation, on event servicing and driver tuition. 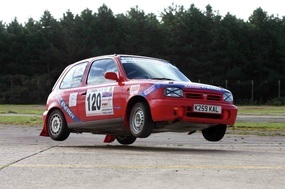 We can also hire out a "get you started" junior car which has had a 100% finishing record, a more competitive Micra, or custom build a car to your specifications. Major Motorsport are recognised for producing professional drivers with great results in the Junior Formula 1000 championship.